Rob McCoy is pastor of Godspeak Calvary Chapel church and, as of Tuesday, mayor of Thousand Oaks, California. In September, over some neighborhood opposition, his congregation moved into a former YMCA facility that was bought and renovated by the foundation of Dan Wilks, a Texas fracking billionaire who supports Religious Right and Christian nationalist causes. According to the Citizens Journal, Wilks was on hand to celebrate the move. The former YMCA was bought for $2.85 million in January by the Texas-based nonprofit Heavenly Father’s Foundation, which plans to lease it as the new home of McCoy’s church. McCoy said he is a “very dear friend” of the founder of the foundation, Texas billionaire Dan Wilks. Why are these Texans so interested in a local politician in California? The connection is Christian nationalist David Lane. For more than two decades, Lane has been organizing gatherings that bring together conservative pastors and politicians with the hope of getting pastors to preach more aggressively about politics and to get their congregants to vote. Lane says it was McCoy, his pastor, that inspired his more recent effort to recruit a thousand evangelical pastors to run for public office. Part of Lane’s theory is that is pastor-candidates can each mobilize hundreds of congregants as volunteers, and the resulting impact could be felt on campaigns up and down the ticket. The Wilks brothers, who were interviewed by the Christian Broadcasting Network at one of Lane’s events in Iowa in 2013, have funneled lots of money to Lane’s American Renewal Project (and other Religious Right causes) through the foundations they set up after selling their fracking services company for billions of dollars: Dan and his wife Staci have Heavenly Father’s Foundation, while Farris and his wife have the Thirteen Foundation. Liberty Counsel, which has received huge donations from Wilks foundations, defended the sale and occupancy of the new Godspeak building against legal challenges brought by a local community group. A major donor to Republican and conservative Christian causes, Dan Wilks was invited to Israel along with former Texas Gov. Rick Perry, whom McCoy knows though David Lane, a member of McCoy’s church and founder of the American Renewal Project. Lane is a significant behind-the-scenes player in the GOP, which has enabled McCoy to make connections with the likes of Sen. Rand Paul and Sen. Ted Cruz, among others. McCoy said Wilks was touched by his teachings and they struck up a friendship. In the years following their initial meeting, Wilks has flown the pastor to visit his ranch in Cisco, Texas, and Wilks has visited McCoy in Newbury Park. After attending a sermon at Godspeak, McCoy said, Wilks told him in his Southern drawl that he wanted the church to be in a better location. “He liked my teaching and decided to be a blessing,” McCoy said. McCoy was intimately involved in two events for pastors that were held by the California arm of Lane’s American Renewal project in southern California in September to encourage pastors to get their congregations mobilized for this year’s midterm elections. 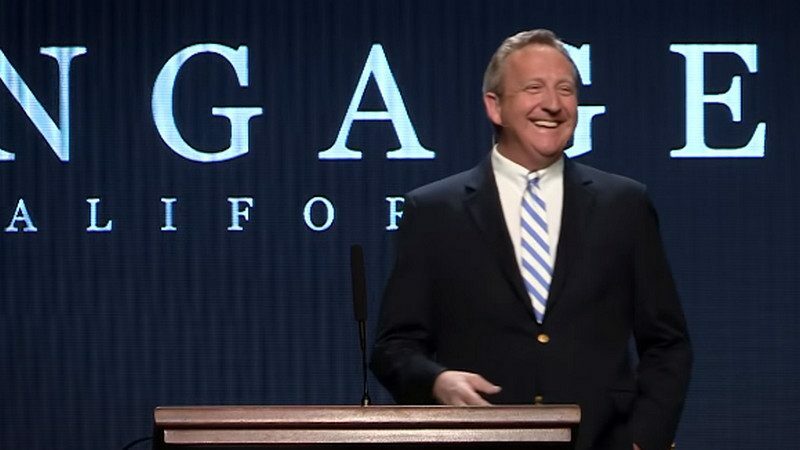 On the Saturday before the election, McCoy took part in “Engage California,” a conference sponsored by another congregation in the Calvary Chapel network. McCoy talked about the fact that Chuck Smith, the founder of the Calvary Chapel movement, generally stayed away from politics. But now that’s changing. It has been an extremely challenging fall for McCoy and his community; just after the elections, Thousand Oaks experienced both a deadly mass shooting and a wildfire that forced the evacuation of part of the town.